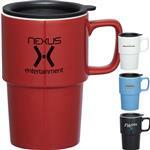 Laser engraved jumbo ceramic mugs with your custom logo! 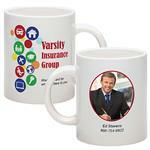 Want more than boring print on a mug? 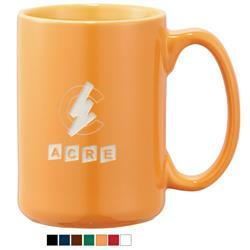 Cozy ceramic mug with two tone finish and a comfortable c handle. Choose between color imprinting or our new cutting edge laser decorating method. 14 oz size. Comes in black, blue, red, green, orange, brown and white. RUSH PRODUCTION AVAILABLE! Available Colors: Comes in black, blue, red, green, orange, brown and white. Dimensions: H 9" x W 2.8" x L 2.8". Available Imprint Options: Laser Engraving and/or Color Print. 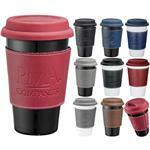 Cozy ceramic mug with two tone finish and a comfortable c handle. Choose between color imprinting or our new cutting edge laser decorating method. 14oz.